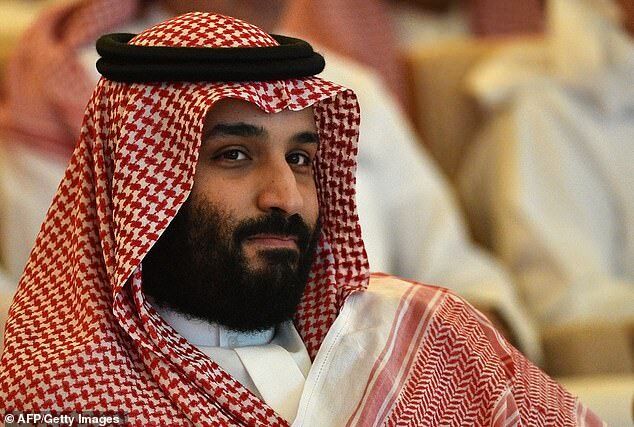 Jared Kushner advised Saudi Crown Prince Mohammed bin Salman to resolve his conflicts in the Middle East and avoid further embarrassments, after the murder of Jamal Khashoggi, it has been claimed. 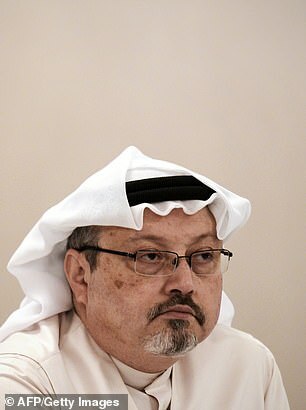 The New York Times reports that a source from the Kingdom of Saudi Arabia claimed they spoke on the phone after news emerged of the journalist’s October 2 death inside the KSA Istanbul embassy. The White House only recognizes one official talk between the pair after Khashoggi’s killing – an October 10 chat where national security adviser, John R. Bolton, took part and American ‘asked for more details and for the Saudi government to be transparent in the investigation process’. White House officials declined to comment specifically on one-on-one communication between the prince and Trump’s adviser after the death of Khashoggi. However it was alleged the duo enjoyed multiple unofficial phone calls and eventually started speaking on a first name basis and even text each other via Whatsapp. The Times says three former White House officials and two people briefed by the Saudi royal court participated in their report that claims their friendship got so concerning the National Security Council staff members were strictly reinstated to listen in on all calls. According to Hezbelloh sympathizing Lebanese newspaper, Al Akhbar, which shared email and text message communications with them, it was part of a string of talks in a friendship orchestrated by the Saudis to gain favour from Donald Trump. As the US President’s adviser, Kushner was reportedly regarded as an easy way in for the Middle Eastern royal who was yet to oust his cousin, Prince Mohammed bin Nayef, and take on the prominent position in 2017. The report states that the Saudis initiated a plan before Trump was elected and even offered help in the lead-up to him being voted into power. A slide presentation viewed by the Times showed communication where a member of the Saudi delegation reported back after a trip to the US in November 2016. ‘The inner circle is predominantly deal makers who lack familiarity with political customs and deep institutions, and they support Jared Kushner,’ it reads. The Times said several Americans involved confirmed the conversation topics. Playing off Kushner’s lack of knowledge about the Middle East, Lebanese American real estate investor Tom Barrack is said to have had email communication in May 2016 with the Emirati ambassador in Washington, excitedly talking about how easily influenced he is. The United Arab Emirates is said to have also been pushing for Salman to become the top prince and carry out many of the duties reserved for his aging father King Salman. Kushner ended up meeting Crown Prince Mohammed bin Zayed of Abu Dhabi, UAE during his unannounced visit to New York to discuss the Israel-Palestine conflict. According to the Times, Zayed had his ear and showed his keenness on Salman becoming the leader. By March 2017 Salman was invited to attend a White House dinner when German Chancellor Angela Merkel pulled out due to a snowstorm, despite him not being head of his state. Royal aides who met with Kushner on election month prepared for a May 2017 visit from the Trumps by noting earlier flaws in their communication with him. ‘Kushner made clear his lack of familiarity with the history of Saudi-American relations and he asked about its support for terrorism. After the discussion, he expressed his satisfaction with what was explained about the Saudi role in fighting terrorism. 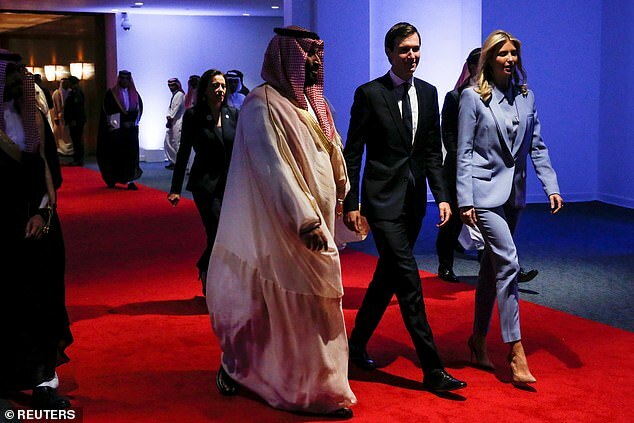 According to the Times, the Saudis managed to influence Kushner by getting him involved in issues such as lifting the ban on women driving in the country and presenting Salman as the most relaxed royal in regards to dealing with Israel-Palestinian conflict. They also appeased by saying they would have ‘high-level coordination’ to help with Trump’s plan for ‘extreme vetting’ from the Middle East and ‘defeating extremist thought’. Trump ended up inaugurating a KSA version of a ‘joint center to fight the ideology of extremism and terrorism’ during his trip to Riyadh in May 2017. Some countries in the Gulf cut off ties with Qatar very soon after the Trumps’ returned from their Saudi visit, with the region claiming the country is heavily linked to terrorism. When Kushner took an unannounced trip to KSA in November 2017, Salman detained 200 people – including some of his royal relatives – in a move to show the world he was fighting corruption from the super wealthy. Other ways the country wooed Trump’s team through Kushner included proposing ‘an Arab NATO’ with tens of thousands of troops ‘ready when the president-elect wishes to deploy them’ and feeding $50billion into US defense, increasing investment in the country to $200billion and to team up with other countries in the Gulf region to put $100billion into American infrastructure. They also promised a welcome celebration for Trump like no other leader had had before if he launched the initiatives. 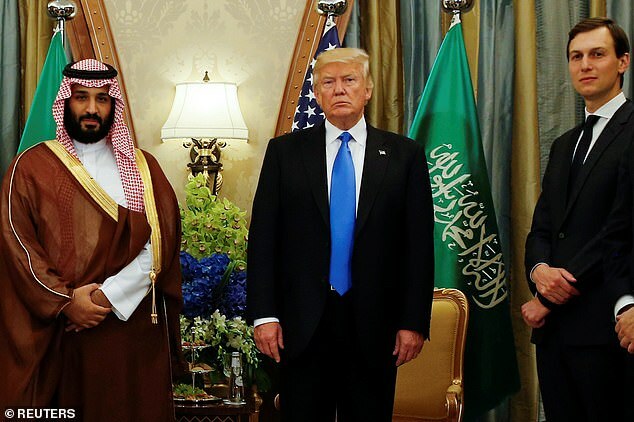 Saudi Arabia reportedly positioned the relationship as one that would go down in history and solidify Trump’s legend by finally coming to a peace deal in the region. However sources said when Kushner relayed the idea to then-secretary of state Rex W. Tillerson, was worried about being seen to be too close with the rulers in Riyadh, and believed it would mean giving up leverage. ‘There was a risk the Saudis were playing him,’ a former White House official said. The friendship has had some benefit from the US side however, as a source told the Times Kushner was asked to call Salman and persuade him to reopen ports in Yemen. Salman had cut off the way in for critical humanitarian and medical supplies.